While we love hitting the road when the weather warms up, we’re just as happy to go snowshoeing, dog sledding, ice skating, skiing, fat-tire biking and (of course) walking in a winter wonderland. Want to get going? Revel in the stunning sights of the Rockies, bask in Quebec’s old-world charms, soak up Scandinavia’s sparkling snow fields or immerse yourself in Iceland’s wild expanses. Prefer to keep cozy? 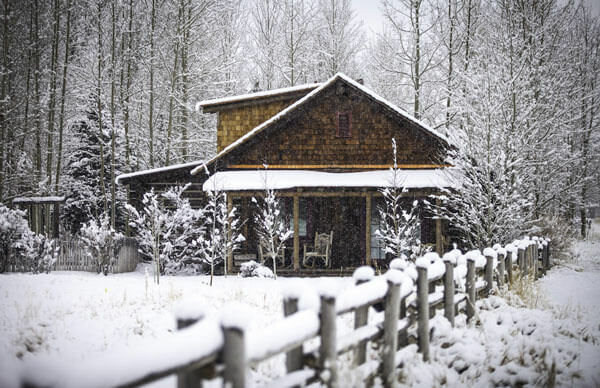 Hunker down for a Spectacular Stay at Montana’s Ranch at Rock Creek or Alaska’s famous Sheldon Chalet. Scroll down to find a winter adventure that will stir your soul and warm your heart. Northern Scandinavia is nothing short of magic. 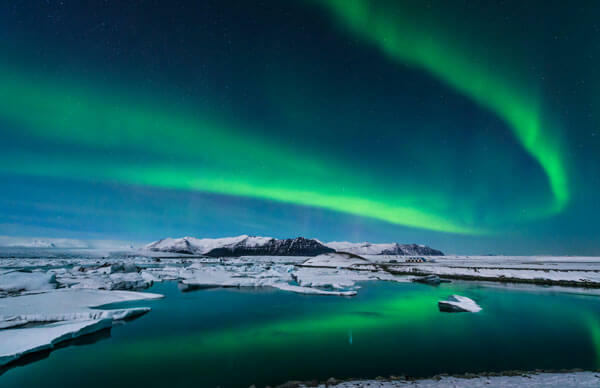 Sparkling snowfields, frozen lakes and striking fjords stretch beneath an endless sky that’s known for its nighttime performance of dancing lights. 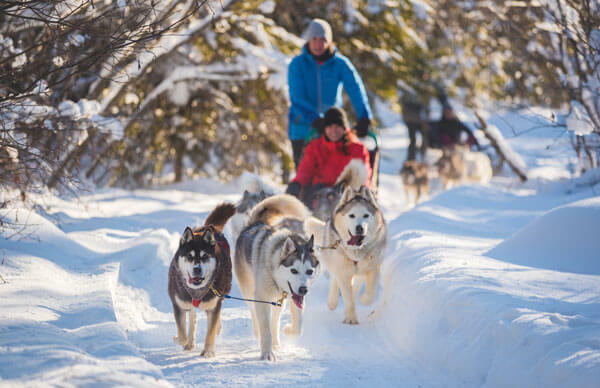 On this trip, dash across snowy fields with huskies, cruise through ice-layered inlets, fish for Arctic king crab and spend the night in a hotel made of ice. 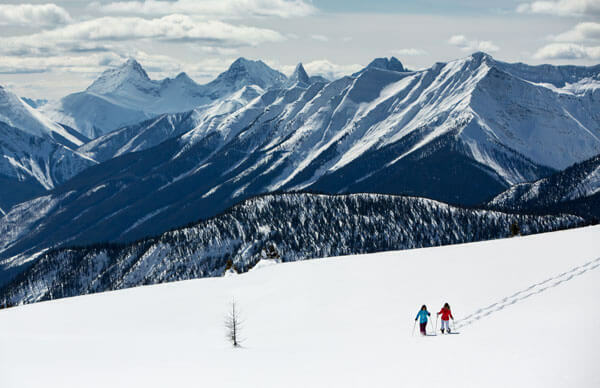 Home to some of Canada’s most idyllic scenery, the Canadian Rockies do winter best. Traverse the ice cathedrals of Johnston Canyon, snowshoe on the glittering snowfields of Sunshine Meadows, and learn to mush your own dog sled team on the Spray Lakes. —then warm up at the iconic Fairmont Banff Springs Hotel! Journey through Canada’s most European province—a place where ice hockey, maple syrup, food and politics are religion (though not necessarily in that order!). Get around by way of ice skate, dog sled, fat bike, toboggan, snowshoe and ski. 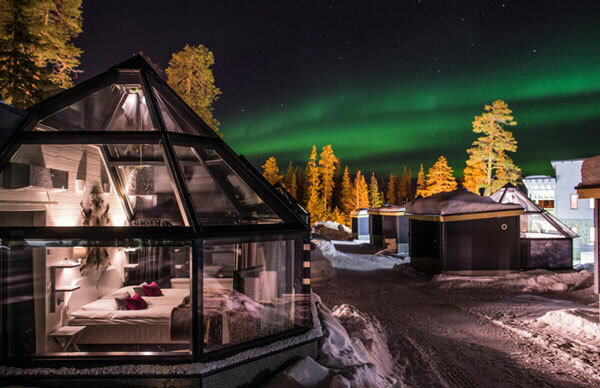 Put an end to the day with drinks by the fireplace in a hotel made almost entirely out of ice! Explore a land of untamed natural beauty and wild abandon on this five-day winter adventure. Spend two nights in Reykjavik and two nights in the countryside where conditions for viewing the Aurora are optimal. Travelling in the comfort of our own 4X4 with a personal guide, we’ll set off for a real winter wonderland adventure! As far as unlikely luxury outpost go, Sheldon Chalet just might take the cake. 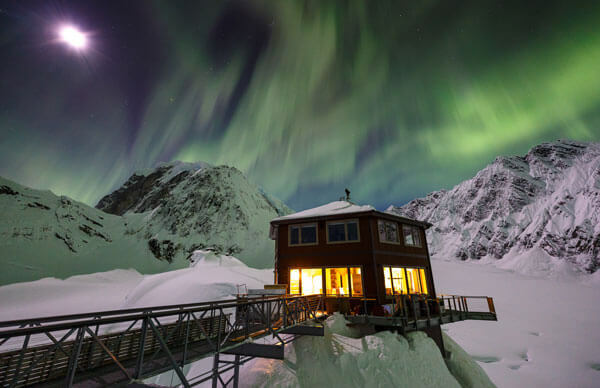 Resting on a granite nunatak within a jagged amphitheatre on the flanks of North America’s highest mountain, the chalet is a true marvel and an unparalleled experience. From the observation deck (or from the comfort of your bed) it is possible to catch the utterly ethereal dance of the aurora borealis. Nestled into one of Montana’s most pristine valleys, The Ranch at Rock Creek offers an authentic 19thC homestead that perfectly balances Western adventure with lavish amenities. Experience awe-inspiring views from “The Top of the World” on horseback. Learn to fly fish on a Blue Ribbon trout stream. Or kick back under the Big Sky in your own private hideaway.